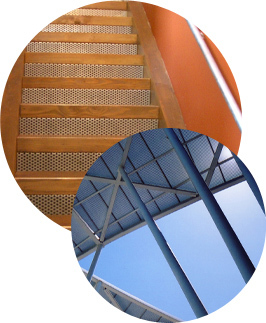 Ferguson Perforating is the premier source of decorative and aesthetic architectural applications. We also specialize in functional and structural architectural design. We offer product in perforated sheet or perforated plate for roof decking and perforated panels for ceilings to lighting fixtures and walkway railings. Ferguson Perforating provides perf for applications in mass transit such as airports and train stations, as well as commercial building applications such as hospitals, theaters, universities and retail establishments.